Yes, you are not mistaken: it looks like a respectable legal journal is falling a prey of the Titanic craze 🙂 But it is not as bad as it seems. This special issue is exploring a variety of legal aspects and consequences of the famous shipwreck: legal repercussions from its sinking; the rights of different parties over the Titanic, protective legislation, jurisdictional issues, and differences in states’ legislations on underwater cultural heritage. As of June 4, McGill Student, Faculty and Staff loan periods will change. The Undergraduate loan period will be extended from two weeks to six weeks, Graduate students will be able to borrow items for four months (up from six weeks) and faculty/staff loan periods will increase from one term to one year. Begining June 4, McGill Library is eliminating late fees for regular books, journals, and music scores for all McGill students. Please do not forget, that fines for laptops, AV , reserve, and recalled materials/ books are still in force! Please be advised that Law Library’s HVAC system is being cleaned at the moment. Workers are moving from the top floors of the building to the ground level, cleaning one floor at the time. It is long-needed maintenance that can be noisy, so if you are looking for a quiet place to study, at present, upper floors can be a good choice. Some of you have probably wondered how you can keep up with what is happening on the Web. If you are a person who prefers information and updates to be “pushed” to you rather than going and finding them yourself, RSS feeds are for you. RSS is the most common format of the feeds, which are the data format used for providing users with frequently updated content, such as blog entries or news headlines, in a standardised format. If you subscribe to the RSS feeds from a site or a blog, e.g. this blog, you will receive a notification in your ‘feed reader’ every time when this web resource is updated. 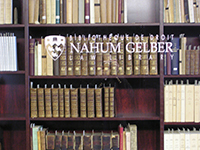 You can see a yellow RSS icon at this bolg’s page under the picture of the Law Library. If you would like to know more about RSS feed and how to use them, take a look at this video, RSS in Plain English. Dear Law students, if you do not want to find yourself blocked from registering to classes, printing, or borrowing from the library, please do not forget to pay your fines. Last week, I was looking for a book in our Rare Books room and stumbled upon this creative example of use of an annual volume of the Statutes of Canada 1863. 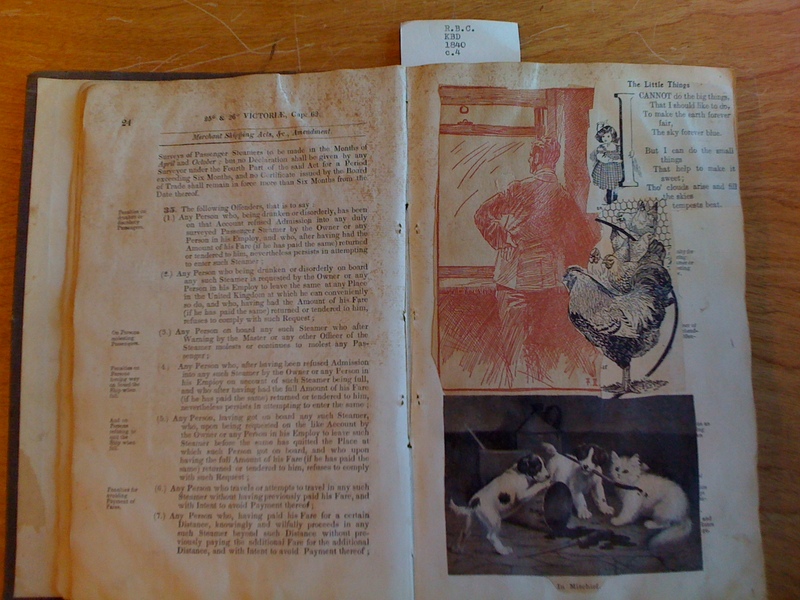 Apparently, this volume was used by some children as a scrap-book.